Extra Strength Iron Contamination Remover. Brake pads shred when brakes are applied, causing tiny hot, sharp iron particles to become airborne. These particles attach to the nearest substrate and instantly bond. As they oxidise they swell and left in situ may cause permanent pitting on the substrate’s surface. Iron contamination should, therefore, be removed on a regular basis to avoid unsightly and damaging build-up. 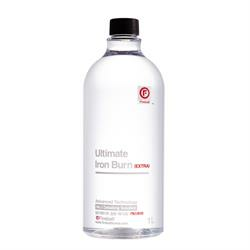 Ultimate Iron Burn is a spray-on solution designed to shrink the iron particles, breaking their bond with the underlying substrate and allowing them to be freely rinsed away. The product changes colour to a deep purple on contact with iron, highlighting the areas of contamination. Also available as Iron Burn regular strength for moderately contaminated vehicles, or recent contamination that has not been allowed to bake on over a longer period of time.